The following address was delivered by Professor Roberto de Mattei at the Una Voce Canada Annual General Meeting held at Holy Family Parish, Vancouver, British Columbia, on November 10, 2018, and appears here courtesy of Una Voce Canada. The Church is the Mystical Body of Christ: a reality that transcends history, but in history lives and battles and hence is called the Church Militant. For this reason we cannot speak about the Church without reflecting on the historical horizon in which She operates. In 2017, we commemorated three Revolutions which changed [the course of] history: the Protestant Revolution, the French Revolution and the Communist Revolution. Three Revolutions that are part of a single revolutionary process. 2018 is the anniversary of two events positioned inside the same revolutionary process: the hundred years since the end of the First World War and the fifty years since the Revolution of 1968. Two anniversaries that help us to place the crisis of the Church in its historical context. The First World War shook up the political geography of Europe. The disappearance of the Austrian Empire deprived the European continent of its centre of gravity, paving the way for the Second World War. But the postwar period of the early 20th century was principally a Revolution in the culture and mentality of European man. It was the end of an era. We ought to reread the memoirs of the Austrian writer Stefen Zweig (1881-1942), Die Welt von Gestern (The world of yesterday). Zweig writes in this book: “If I try to come up with a convenient formula to describe the time preceding the First World War – the period I grew up in – I believe the most concise possible would be to say that it was the age of certainty. In our almost millenary, Austrian Monarchy everything seemed to be eternal and the State itself appeared to be the supreme guarantee of this continuity. (…) Everything in the solid Empire appeared to be sound and immovable and in the highest position there was the venerable old Sovereign; (…). No one was thinking about wars, revolutions and upheavals. Any radical act, any violence, appeared then to be impossible in the age of reason”. Everything appeared eternal, sound, immovable. However, behind those stable and apparently indestructible institutions, on which society was based, from the family to the Monarchy, there was a conception of the world founded upon an order of unchangeable values. The guardian of these absolute values, was, and still is, the Catholic Church. Stability, order, equilibrium are all good things, but there is not one good thing in this world that doesn’t come from the Church, the only Divine and always perfect institution, no matter how imperfect the men who represent Her can be. During the First World War the Russian Revolution broke out. It was the matrix for all the other social and political revolutions that came after. The totalitarianisms of the 20th century destroyed the old order, but they didn’t build a new order. The essence of totalitarianism is not the hypertrophy of the State, as many believe, but the destruction of the natural, social order. Totalitarianism dissolves, in effect, all principles and institutions and renders man destitute of any social protection - to achieve the dictatorship of chaos. Political, intellectual and moral disorder was the common thread of the 20th century - the century of revolutions, world wars and genocides. The bloodiest century in Western history. The Sixty-Eight revolution was a Revolution that didn’t shed blood like those previously, but it shed something much worse: it shed the tears of a generation that didn’t only lose their bodies but lost also their souls. Sixty-Eight was the most devastating of all the preceding Revolutions because it enthroned chaos in the everyday life of Western man. Sociologists like Zygmunt Baumann, in defining our age spoke of a “fluid society” in which all forms are dissolved, even basic ones of social aggregation. The “fluid life” that Baumann writes about is the precarious and ephemeral life of modern man: a life devoid of roots and foundations, as he lives only for the present, immersed in the liquefaction of all values and institutions. Everything that is liquidated, is consumed, or, we might say, everything that is consumed, is liquidated: from food products to individual lives. Everything is fluid, since everything changes, everything is in a state of becoming. In philosophical terms we might define our society as based on the triumph of pure becoming, the most radical negation of the primacy of Being that has ever existed in history. The fluid society cannot be compared to a river that flows, since the river comes from a living source and has a destination: the immense sea that awaits it. The fluid society has no destination: it just erodes the rock. Yet it only erodes the surfaces, dissolves the incrustations and everything is transformed into mud. Rock in its essence is indestructible. Nothing can be done against the force of being. The first name of God is Being, as God Himself revealed to Moses at the burning bush (Exodus 3, 14). All the divine attributes flow from this Being as from a primordial spring. Every perfection in reality comes down to a grade of being which refers back to an absolute Being, without limit and without conditions. This philosophical primacy of Being has been taught by the Church ever since its birth. The Church has a doctrine and a law which is absolute and immutable and reflects the eternal law, which is God. This law and this doctrine are contained in Holy Scripture and in Tradition; the role of the Magisterium is to preserve it and to hand it on. Not one iota of these principles can be changed. Of course, throughout history, Christians may have distanced themselves from the truth and from the precepts of the Church in their personal lives. These are the epochs of decadence which demand a profound reform, i.e. a return to observance of abandoned principles. If this does not happen, then the temptation is to transform the immoral behaviour into principles which are opposed to Christian truths. This temptation penetrated the Church during the Second Vatican Council and is now proposed to us via the concept of the primacy of pastoral practice. The slogan of the Second Vatican Council was: it is forbidden to condemn, since condemnation is a negative attitude, which results in aggressive reactions in the one that is being condemned. It is forbidden to condemn means that there is no need to fight evil or else evil will fight us. 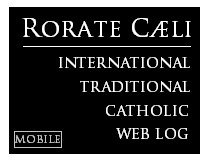 A slogan that anticipated, not followed Vatican II. According to the progressive theologians, the cause for the rejection of the Church and anticlericalism of the 19th and 20th centuries was in the intolerant attitude that the Church had against Her enemies. The transition to a new kind of pastoral care would appease enemies, and would open up a new era of peace and collaboration with the Church. The appeasing coexistence, Ostpolitik, the historical compromise and today’s agreement with Communist China, originate from this pastoral Revolution. The outcome, nonetheless, was not a decrease but an exponential increase of anti- Christianity in the world. The Church, in Her visible structures, lost Her militant identity and has been liquefied. Pastoral care is that which through updating. is modified and transformed continuously. The primacy of the pastoral signifies a fluidization of the principles and institutions of the Church. The solid, permanent Church with a backbone has been replaced by a “fluid” Church, like the society in which we live. This new Church is based on the primacy of becoming over Being and of evolution over Tradition. Principles, truths, certainties are solid because they constitute a channel that ensures the waters of the river are not dispersed; they are a dam that ensures the lake will not overflow. If the dam fails, society will be flooded by the water. This is the spirit of Vatican II. This process in the liquefying of the Church and society is a revolutionary project that started a long time ago. We know the Permanent Instruction of the Alta Vendita, a secret document written in early 19th century that mapped out a blueprint for the subversion of the Catholic Church. The entire world has witnessed a profound change within the Catholic Church on an international scale, a change that is in step with the modern world. The anti-Christian revolution which runs through history bears a hatred for Being in all its expressions. Opposed to Being, it rejects all that is stable, permanent and objective in reality, starting with human nature. The Church, Family, private property and the State are denied at their roots because social institutions, rooted in human nature, are said not to exist: everything is the product of a historical process. Man himself is said to be deprived of any true nature: man is amorphous matter which can be pressed into shape and adapted at will. The Gender Theory is a product of this evolutionary vision, according to which man has neither his own nature nor essence. The only alternative to the nihilist revolution which today is attacking not only the Church, but the natural order, not only the natural order but even human nature itself, is to re-discover the fullness of Being in all its forms. To do this is also to re-discover the stability and permanence of the real in all its forms, both individual and social. We must oppose the fluid conception of the world, based on the primacy of becoming, with an axiological vision based on the primacy of Being. Axiology is the science of values. Value is “that through which a thing has worth”. Value is therefore that which gives reality its significance and its perfection. Values are principles whose perfection is rooted in the supreme principle of all reality. Above all principles there is a universal principle, which is the centre and source of all laws without exception. This is God, the most perfect Being, the first principle, the First Truth, as St Thomas defined Him, on which the ultimate principles, absolute values and universal truths are based. Only God does not change, and only that which is based in God and dwells in Him deserves to be preserved, handed on and looked after. The Church, immutable in Her Divine constitution, Her doctrine and Rites, is the image on earth of the perfection of Being. And in the Church the reflection of the Divine Being is Her Tradition. Tradition is that which is stable in the eternal becoming of things. It is that which does not change in a world which changes, and it is this because it is a reflection of eternity. The Church's Tradition, like Holy Scripture, is a source of Revelation, divinely assisted by the Holy Spirit. Tradition is the Word of Jesus Christ teaching his Apostles before and after his Passion, Death and Resurrection. In the forty days between the Resurrection and the Ascension, He appeared several times to his Mother and to the Apostles and explained clearly, and in detail, the sense of the mission of the Church He had founded. He explained the significance of the Last Supper and of the Divine Sacrifice which they had to perpetuate. The first Mass, celebrated by St Peter, followed meticulously the instructions of Christ and has been handed down to us by that rite which we call traditional. We know that Divine Revelation concluded with the death of the last apostle, St John. However this Revelation is not contained only in the four gospels and in Holy Scripture, but also in the teachings which the Apostles received from Christ's own lips. We can imagine to what extent Our Lady preserved and memorised all these truths and these rites in her pure Heart, and with what faithfulness She then passed them on to the Apostles. St John was not only the last to hand on in person the words he had heard. He was also, through his intimacy with Our Lady, perhaps the one who received to the greatest extent the light of Tradition. He died at the end of the 1st century and only a few years after his death, the lex orandi and the lex credendi of the Church had been immutably defined. In the course of the following centuries, the Church would explain, clarify and define these truths. But she never innovated or transformed them. The mission of the Church is to keep custody of Tradition, to defend it and to hand it on. There is a relationship, which Father Calmel has brought to light, between the immutable and permanent nature of the Church, on the one hand, and human nature, on the other, which is equally stable and objective. It is not just the perfection of its divine origin “which makes the Church definitive and unchangeable”, says Father Calmel. “It is also the stability of the characteristics of the human race which the Church has the mission and the power to enlighten and to save.” Stability of rites in defence of the sacraments; stability of the dogmatic formulae in defence of revealed truths; stability of the lex orandi and of the lex credendi. Tradition is not only the regula fidei, the rule of the faith of the Church; it is also the foundation of society. The Church, indeed, is our leader not only in faith but also in morals. The morality of a society is expressed in practices, customs and habits, that is, in a historic and concrete tradition which reflects divine and natural tradition. Tradition judges history not in the name of history itself but instead in the name of the truths which transcend it. In this world, whether we are speaking of moral life or of physical life, there are some things which pass away and other things which remain. Tradition is the incorruptible and immutable element of society. Tradition is that which does not pass away. And it is only within Tradition that progress is possible, because we cannot progress or improve ourselves in things which pass away. We can do so only in things which remain. Tradition is that of the past which lives in the present; it is that which must live in order for our present to have a future. It is the ultimate root of all that which is, and of all that which will be. It is God Himself, in Whom past, present and future are grounded in a single and infinite act of being. What encourages our conscience, enlightened by the eternal and immutable Magisterium of the Church, is Tradition, that Tradition which goes from being a remote rule to a close one when the actual living magisterium vacillates. In the Church, indeed, the ultimate rule of faith during periods when people desert it, is not the contemporary living Magisterium, in its non-definitive aspects, but instead the eternal Magisterium which, together with Holy Scripture, constitutes one of the sources of the Word of God. There is nothing subjective or Protestant in this position. What subjectivists and Protestants do is to replace the Magisterium of the Church with a different magisterium. They deny the Church's right to teach the truth and they replace the truths taught by the Church with their own truths. There is none of this in our approach. We do not claim to replace the Magisterium of the Church with any other magisterium. We see ourselves as simple members of the learning Church, ecclesia discens, simple faithful who believe that the teaching Church alone, ecclesia docens, has the right and duty to teach. The expression “simple faithful” contains the little that we are but also the lot. The learning Church is not the teaching Church but just always the Church, assisted by the Holy Spirit. As simple faithful, we are members of the Mystical Body: while we do not have the right to teach, we have the right to ask our pastors to confirm us in the faith. We are guided in this by our conscience, which is not subjective but which is instead rooted in faith. Our conscience tells us not to retreat, but instead to raise the banner of Tradition. One becomes part of the Church by means of the Sacrament of Baptism, which is fulfilled in the Sacrament of Confirmation. Through Baptism we enter the Church Militant; but it is Confirmation which makes us true soldiers of Christ. Baptism instils the faith, Confirmation requires us to profess it and defend it in public. Baptism and Confirmation instil in us the sensus fidei which is the shared awareness of the faithful. This is adherence to the truths of the faith by supernatural instinct, more than by theological reasoning. Tradition is maintained and transmitted by the Church, not only through the Magisterium, but through all the faithful, “from the bishops down to the laity” as the famous formula by St. Augustine expresses. The doctor from Hippo makes an appeal in particular to “the people of the faith” who do not exercise a Magisterium, but on the basis of their sensus fidei guarantee the continuity of the transmission of a truth. It was sensus fidei which guided faithful Catholics during the Arian crisis of the fourth century. It was then that St. Jerome coined the phrase wherein “the whole world groaned and woke astounded to find itself Arian”. What is important to underline is that it wasn’t about a doctrinal dispute limited to some theologian, nor a simple clash between bishops where the Pope had to act as an arbiter. It was a religious war in which all Christians were involved, from the Pope down to the last faithful. Nobody closed themselves up in a spiritual bunker, nobody stood looking out the window, a mute spectator of the drama. Everyone was down in the trenches fighting on both sides of the battle-lines. It wasn’t easy at that time to understand whether your own bishop was orthodox or not, but the sensus fidei was the compass to orient oneself. Saint Hilary writes that during the Arian crisis the ears of the faithful who interpreted in an orthodox sense the ambiguous affirmations of the Semi-Arian theologians, were holier than the hearts of the priests. The Christians who for three centuries had resisted emperors, were now resisting their own Shepherds, in some cases even the Pope, guilty, if not of open heresy, but to say the least, of grave negligence. There are times when a Catholic is obliged to choose between cowardice and heroism, between apostasy and holiness. This is what happened in the IV century and it is what is happening even today. Cardinal Willem Jacobus Eijk, Archbishop of Utrecht, summarized the question earlier this year in these terms: “the bishops and, above all, the Successor of Peter are failing to maintain and transmit faithfully the Deposit of Faith.” These are very strong words which directly call into question the Successor of Peter, Pope Francis. A situation without precedent in history. Yet, the history of the Church is always new, but always repeating itself. It is always new because the external persecutions and internal crises She endures, change: they have different motivations, different protagonists, different magnitudes and different intensities. But in these crises, no matter how deep they can be, there is something that doesn’t change: the force of Tradition, which is destined to defeat any Revolution that opposes it. Nevertheless, the Revolution of Sixty-Eight failed because it was born of a protest against a one-dimensional society, the bourgeois society of comfort and wealth – but the society that Sixty-Eight produced – contemporary society – is the society par excellence for consumerism and hedonism; it is a relativist society in which all the flames of idealism have been snuffed out. Today reality is interpreted as a system of power, mostly economic, not of values. Power - power without truth, is the only value of our time. All values – the philosopher Augusto Del Noce points out – are destined to be incorporated into the category of vitality. But a society that is unaware of any principle other than that of pure expansion of vitality can only dissolve. Certainly the blessed hour of victory will be preceded by a great chastisement, because the contemporary world has not followed the example of the inhabitants of Nineveh, who were converted and saved, but rather that of the inhabitants of Sodom and Gomorrah, who refused conversion and were annihilated. The theology of history tells us that God rewards and punishes not only individual people, but also collectives and social groups: families, nations, civilizations. But while individual people have their reward or their chastisement sometimes on earth but always in eternity, nations – which do not have eternal life – are punished or rewarded only on earth. The revolutionary process consists in a plot of offenses against God which, linked together over the course of centuries, form one single collective sin, an apostasy of peoples and nations. And because each sin has a corresponding chastisement, the Christian theology of history teaches us that collective sins are followed by great historical catastrophes, which serve to pay for the public sins of nations. In these catastrophes the justice of God is never separated from His mercy, and because the mercy of God is linked to repentance, chastisement becomes inevitable when the world, by refusing repentance and penance, calls down upon itself not mercy, but the justice of God. God however, does not cease to be infinitely merciful but at the same time He is infinitely just, and the theology of history shows us that from the creation of the universe to the end of the world there have been and will be immense sins which are followed by acts of the immense mercy of God. The sin of Revolution, which in the course of the centuries thwarted the development of Christian Civilization and has led us to the spiritual and moral ruin of our time, cannot but arouse a reaction which, sustained by divine grace, will lead to the historical fulfillment of the great plan of Divine Providence. We are the defenders of Tradition and two virtues are required of us: fortitude and confidence. 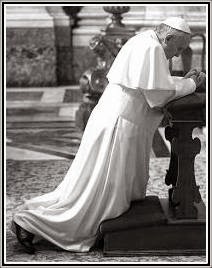 Fortitude is the virtue of those who do not retreat and resist; confidence is the virtue of those who hope in the victory promised at Fatima by Our Lady Herself to the Catholic faithful. The militant spirit of those who resist and trust must characterize our battle. The heart of Tradition is in God, whose very essence is immutable and eternal Being. It is in God, and only in God, and in Her who is His perfect echo, the Blessed Virgin Mary, that the defenders of the faith and Tradition can find the necessary supernatural strength to brave the current crisis. We are warriors without power. Warriors without weapons, faced with an enormous Goliath. And, from a human point of view, without power, without weapons, a battle cannot be won. Nevertheless God is pleased with our weakness and asks of us only a militant spirit. It will be God, through the Blessed Virgin Mary, Who gives us the weapons and the power to fight a battle that is not ours, but His. And God always wins – in time and eternity. Cf. Plinio Correa de Oliveira, Rivoluzione e Contro-Rivoluzione, Sugarco, Milan 2009. Stefan Zweig, Die Welt von Gestern. Erinnerungen eines Europaers, tr. it. Il mondo di ieri, Arnoldo Mondadori, Milan 1994, pp. 9, 27-28. Robert Conquest, Reflections on a ravaged Century, W. W. Norton & Company, New York 2001. Zygmunt Bauman, La vita liquida, tr. it. Laterza, Rome 2006, p. IX. John XXIII, Allocution Gaudet Mater Ecclesiae of 11 October 1962, in AAS, 54 (1962), p. 792. Roger T. Calmel o.p., Breve apologia della chiesa di sempre, Editrice Ichtys, Albano Laziale 2007, pp. 10-11. John Vennari, The Permanent Instruction of the Alta Vendita, Fatima Center, Buffalo, N. Y. 2018. Summa Theologiae, II-IIae. q. 1, a. 1. R. Th. Calmel, o. p., Brève apologie pour l’Eglise de toujours, Editions Difralivre, Maule 1987, p. 23. Cf. R. de Mattei, Apologia della Tradizione, Lindau, TUrin 2011. St. Jerome, Dialogus adversus Luciferianos, n. 19, in PL, 23, col. 171. Summa Theologiae, I, q. 14, a. 10, resp. Augusto Del Noce, in Aa. Vv., La crisi della società permissiva, Ares, Milan 1972. Marcantonio Colonna (Henry Sire), The Dictator Pope. The Inside Story of the Francis Papacy, Regnery Publishing, Washington 2017.